Twelfth Tai Situpa, Awakening the Sleeping Buddha (Shambala). Bokar Rinpoche, Meditation Advice to Beginners (Clearpoint). 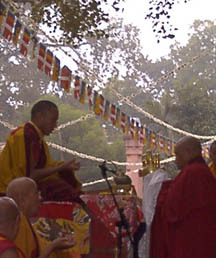 Khenpo Karthar Rinpoche, Dharma Paths (Snow Lion). "May everyone be happy and safe, and may their hearts be filled with joy. "May all living beings live in security and peace, beings who are frail or strong, short or tall, big or small, visible or not visible, near or far away, already born or not yet born. May all of them dwell in perfect tranquility. "Let no one do any harm to anyone. Let no one put the life of anyone in danger. let no one out of anger or ill will wish anyone harm. "Just as a mother loves and protects her only child at risk of her own life we should cultivate boundless love to offer to all living beings in the entire cosmos. Let our boundless love pervade the whole universe, above, below and across. Our live will know no obstacles, our heart will be absolutely free from hatred and enmity. Whether standing or walking, sitting or lying, as long as we are awake, we should maintain this mindfulness of love in our own heart. This is the noblest way of living. "Free from wrong views greed and sensual desires, living in beauty and realizing perfect understanding, those who practice boundless love will certainly transcend birth and death."